What happens when we can’t find five things we legitimately like about an episode? This episode wasn’t a disaster, but it was really dull. SNL counted on JK Simmons’ dependable ability to disappear into a role, rarely making him the focus of a sketch, but other than the monologue the writers never really exploited the rage that Simmons tapped into in Oz, Spider-Man, Party Down and so many other roles. I mean, this is Vern Schillinger! Maybe the most frightening character in TV history! And SNL didn’t do anything with that. It felt like they just raided the drawer labelled “old man sketches” and used whatever they pulled out. Again, though, it wasn’t a disaster. There was just enough quality business to scrounge together a list this week. 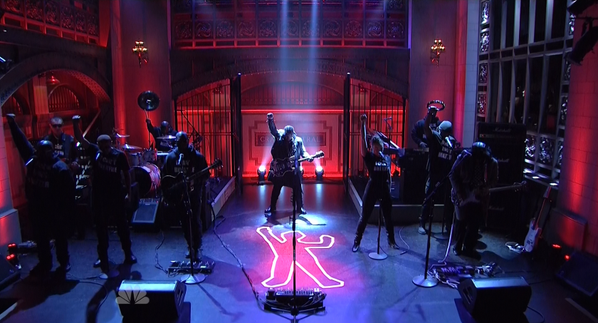 Let’s adventure together into the past as we relive the best parts of last Saturday’s SNL. The show’s highlight had absolutely nothing to do with comedy. D’Angelo played two songs from his excellent album Black Messiah, and used the second for the kind of political commentary that shouldn’t be even remotely controversial and yet probably inspired a 400-comment Free Republic thread full of hatred and racism. His band wore “I Can’t Breathe” and “Black Lives Matter” shirts while D’Angelo sang in front of a chalk outline on the floor, powerfully reminding a large national audience that the injustices behind last fall’s unrest are neither resolved nor forgotten. We’ve already written about this, but it’s worth mentioning again. Mike O’Brien adds to his resume of great SNL pre-taped segments with this biopic trailer, adorably playing Jay-Z with understated wonder. His speech patterns and mannerisms are almost like a non-southern Kenneth Parcell. Add in hilarious cameos from Simmons and Jason Sudeikis, and you’ve got one of the best SNL bits of the year so far. The latest “Cinema Classics” alternate ending sketch is a one-woman showcase for Kate McKinnon and her Ingrid Bergman impression. She fights hard to contain the urgency with which she wants to hop on that plane and get the hell away from the Nazis, turning the dramatic climax of one of the best films of all time into an awkward bit of suppressed desire. McKinnon is brilliant here, refusing to overplay or resort to schtick. It was the best live sketch of the night. Overall Weekend Update is still a shadow of its former self. Colin Jost has improved slightly, learning how to deliver some punchlines with the right snap, but he’s still one of the blandest news anchors SNL’s ever had. 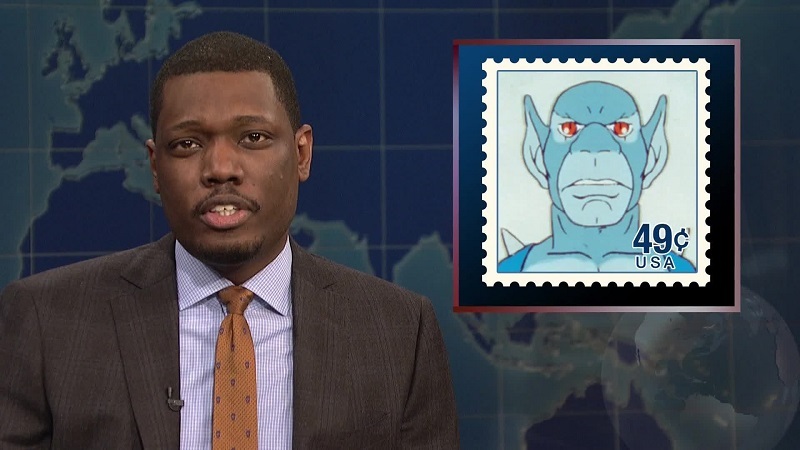 Michael Che still isn’t great, but he’s quickly lapped Jost, and is able to overcome weak material and sometimes poor delivery with his personality. He really needs to take the desk solo as soon as possible. He could have the ability to completely recast the segment in his own image, much like Norm McDonald and Dennis Miller did so many years ago. Other than a few smart jokes about what black people should be on the Black History Month postage stamps, nothing he did tonight was especially memorable, but he was a highlight on an otherwise lackluster night. The Pushie sketch could’ve killed 18 years ago, when Clippy was a contemporary annoyance to Word users throughout the globe. Today it just felt ancient, like something dug out of a dress rehearsal from the Cheri Oteri days. Some of the jokes were good, and Simmons and Aidy Bryant did fine in their limited roles, but the only thing I remember about this sketch two days later is the commitment Bobby Moynihan brought to the role. 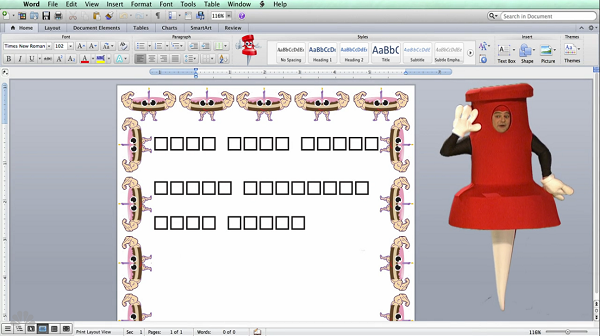 Pushie’s exuberance might be obnoxious, but as played by Moynihan it grows out of an innocent desire to help the user. When the sketch turns at the end, and Pushie tries to make Simmons feel too guilty to “murder” him, Moynihan again plays it perfectly, sad and desperate but not quite mawkish. Moynihan’s been on the show for seven seasons now, which is just insane, and although he’s been one of the best performers on the show that entire time he still doesn’t seem to get his due. He should be just about ready to wrap up his SNL career, and hopefully when he does leave he goes out with the same afforded other recent longtime cast members.